Need a little romantic inspiration to get in the mood for Valentines Day this month? South Africa's Springbok Casino has put together stories and photos of unusual courting rituals of some South African wildlife that might help get you in the mood. From romantic Lovebirds to flirtatious Seahorses, the animal kingdom is full of examples of animals that are just as romantic as we are, in their own way. 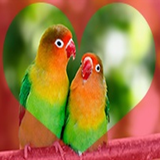 Casino manager Daniel van Wyck has compiled stories about unusual animal courtships to bring out the Casanova in all of us. South African online casino shares unusual African wildlife romances -- and give free spins on Bubble Bubble slot game! Penguins give stones rather than flowers and candy when courting the ladies. With Topi antelopes, it’s the female who fights for the male of her dreams and if she finds him with another she’ll likely barge in and interrupt. Relentlessly trailing a female might be considered stalking in the human world, but it seems to work well enough for the Leopard Tortoise. Instead of taking a girl out to dinner and buying her flowers, male porcupine will stand on his hind legs and soak the female using forceful urine sprays. This month Springbok is giving players free spins on Bubble Bubble, one of its most popular online slots. Springbok Casino has hundreds of online casino games from Realtime Gaming. They’re all played in Rands and customer service is available in either English or Afrikaans. The most popular games are available for smartphones and tablets in the mobile casino and via the free Android App. Springbok was the first online casino to give South African players the option of making deposits and withdrawals in Bitcoins.